Short Fat Dictator: 'NOW I SEE YOU' Book Giveaway! It's giveaway week at Short Fat Dictator! On Tuesday my friend and fellow blogger at A MOM AMOK released her memoir "Now I See You". [Book is Announced] My friend wrote a book! How exciting! OMG I can't wait to read my friend's book! When can I get a copy of her book? [Book Arrives] Oh look! The copy of her book has arrived! Wow! I can't believe I'm about to read the book she wrote! [About to open the book] Ooooooohh noooo! What if my friend's book is TERRIBLE? I am thrilled to report that Nicole's book is NOT terrible. Instead it is terrible's opposite! It is page-turnery and laugh-out-loud funny -- which is especially notable when you consider it is a memoir about going blind. Nicole was diagnosed with retinitis pigmentosa at the age of 19. 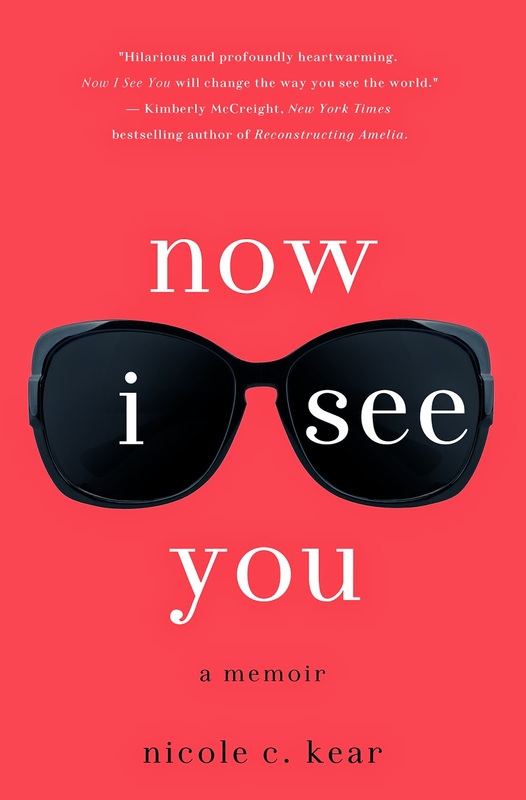 'Now I See You' follows her, post-diagnosis, as she navigates life as a college student, then as a young working woman, and eventually as a mother for whom the reality of "LIGHTS OUT" looms large in the who-knows-how-distant future. NICOLE C. KEAR: I think that my desire to write about the diagnosis was pretty much born the day I got it, at nineteen. Not in a clear sense (I definitely didn’t keep a notes-for-my-future-memoir journal, which, in retrospect, would’ve come in handy) but in a vague, deeply-buried way. I think I wrote the book for the same reason most people write about sad, crappy things that happen in their lives – to try and wrest some purpose from it, so it doesn’t feel so sad and crappy anymore. It TOTALLY worked, incidentally. I highly recommend the idea. SFD: Raising three kids = hard. Raising three kids while going blind = LIKE, SO MUCH HARDER. Why did you have to write a book that makes me feel bad about complaining about my own petty problems??? NCK: Yep, that’s my consolation prize and I’m loving it . . . especially since I haven’t been able to enjoy it for the past nine years, when I was keeping my vision loss a secret. I wish I was so secure and modest and such a deeply good person that I could say it doesn’t make my day when someone says, “I just don’t know how you do it! It’s amazing!” but that would be a lie. I LOVE that comment! I mean, I pretend to be very modest and wave their admiration away, but really I’m just eating it up, doing an internal “Keep it coming” gesture. SFD: Nicole, you have a terrible potty mouth. I mean, in the best possible way. The "voice" of this book feels totally authentic, but a "funny" book about going blind couldn't have been an easy sell. Did you struggle with how to approach this story? NCK: I really didn’t struggle with the approach at all; I knew the only way I could write this story was if it was as funny as it was heart-wrenching. I knew the humor had to be not just sporadic and tension-relieving; I wanted it to be integral, a foundational part of the story, because it’s integral to me, as a person. I’m not saying I laugh my way through life, but it’s basically the only weapon I ever to use to combat anything. I’m a one trick pony in that regard. I remember when my son was born, I read this memoir Cockeyed by Ryan Knighton, about his experience losing his vision because of the same retinal disease, and it was so hilarious and so moving, my mind was blown; his book gave me permission to do what I’d always wanted to do but wasn’t sure was possible in a book about blindness, be really funny. My struggle, actually, wasn’t in bringing the humor in, but in opening up, emotionally. The first few drafts were hilarious but not terribly honest or vulnerable, so I had to keep forcing myself to add that in, and to trust that it wouldn’t be unbearably depressing, like, Milton-level bleak, as was my fear. SFD: The concept in the book of the approaching "LIGHTS OUT" moment resonates so strongly with people. What is on your "bucket list" of must-sees? What are some unusual things that people have told you are on their must-see bucket lists? People’s bucket lists tend to include the same kinds of items; travel destinations, mainly. Sometimes people put really practical things on there – like “pay off my mortgage” (seriously, that’s a common one) -- and that depresses the crap out of me. SFD: The scenes with your family in the book are laugh-out-loud funny. Like, "I read this book on an airplane and my seatmate thought I was insane"- LOL- funny. The passages featuring your larger than life Italian family are especially hilarious and your grandmother "Nonny" is a STAH! Can you just write something else in your Nonny's voice so that I can laugh some more? I could win the freaking Pulitzer and she’d have the same response. Let's say you discovered you were losing your sight - sure, there would be a whole host of downsides but - - - what is ONE THING you be most grateful for never having to see again? ANSWER AND WIN!!!! The winners will be announced on Wednesday, July 2 and the very next days free books shall speed toward them!